At golf’s highest level the putter is clearly the most important club, the mastery of which differentiates Jordan Spieth, Tiger Woods and Jack Nicklaus from the sundry mortals on the PGA Tour. Next comes the Big Dog, with distance off the tee that enables the likes of Bubba Watson and Dustin Johnson to eat very well indeed. For an average golfer with a double-digit index, it’s the wedge that most often contributes to a round that’s more memorable than miserable. After all, it’s the wedge that can get the short hitter onto the green from 50 yards out – – and close enough for a reasonable chance of an up-and-down par. It’s the stuff of a flop shot over a bunker to a tight pin placement, again within range of two-putt bogey at worst. And it’s the rare wedge that gets the average player out of the bunker, consistently in a single try. For me, that wedge is Miura Golf’s 56-degree K-Grind. Having reviewed numerous wedges over the years, I can testify that most are pretty well made. However, until recently I didn’t realize how much I missed my Miura K-Grind, which was stolen on a road trip two years ago. With a replacement finally in hand over the past couple of weeks, pitches are often stopping within six feet of the cup, chips are even closer and bunkers are easily escaped. While I still have too many two-putts, the K-Grind is giving me a better look at a single-digit type of score. Like most folks in this business, I have a rather free choice in the clubs I play. For the past five years, I’ve favored Miura irons. Arguably the most attractive clubs manufactured today – – and especially their nickel chrome muscle-back blades – – Miura’s irons are made of mild steel and precision forged, and then are hand-ground and polished at Miura’s factory in Himeji, Japan. When it comes to wedges, the K-Grind is perhaps the most distinctive on the market. Featuring three “flutes” on the club’s sole – – which look much like fingertip prints or knuckles, perhaps modeled by company founder Katsuhiro Miura – – these indentations function much like channels that reduce resistance, so that the club moves through grass rather than against it, an advantage when chopping out of thick rough. Likewise, because sand slides through these gaps, the club it easier to accelerate through bunker shots, a key to consistent sand play. 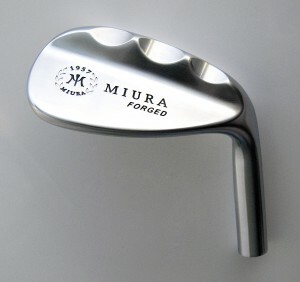 Miura also makes several other wedges, including a line with a black matte finish, and other specific grinds. Although it’s somewhat unconventional with its unusual appearance, the fluted K-Grind seems to perform even better than it looks. That performance has direct roots to another Japanese tradition. Located in the Hyogo Prefecture, Himeji is the ancient home of the master craftsmen who for generations forged and shaped the nation’s finest samurai swords. Their owners undoubtedly guarded one of the more important sites in Japan. 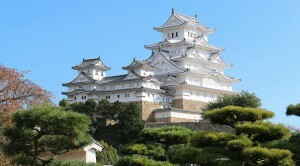 Himeji Castle, in the home of Mirua Golf. That’s the Himeji Castle, which is also known as the White Heron Castle, for its brilliant white exterior and resemblance to a bird taking flight. One of Japan’s 12 original castles, White Heron is more than 400 years old, serving as a strategic defense point on the western approach to the one-time capital city of Kyoto. It is today a World Heritage Site. Today, Mirua Golf uses some of the most pure steel in club manufacturing. Its forging rearranges the molecular structure of the steel into a pattern that’s uniform across the clubface’s hitting area. It’s the tight grain structure that gives Miura irons a soft and controllable feel that’s not found in any other brand of club. When Katsuhiro Miura first introduced the K-Grind, it came only in a 56-degree loft, with 12 degrees of bounce. A few years ago the company introduced 52 and 60-degree K-Grind wedges, with 7 and 13 degrees of bounce, respectively. With a suggested retail price of $275 per club, an investment in these wedges might be the most stylish and shot-saving purchase golfer could make.